I will make Emma a hat this week! Every year I try and make hats for the kids. I wrote about Jack’s hat way back in July, and I even wrote about starting a hat for Emma. Yet, for some reason it didn’t pan out. I think it was because I was short on yarn. 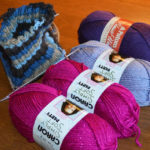 I knew it when I started, and instead of joining a new ball of yarn when I would eventually run out, I wanted to start with a fresh ball of yarn. So here it is, January 2nd, and I am knitting her Christmas hat. I don’t think she really cares that much about when she receives it, just that she does. 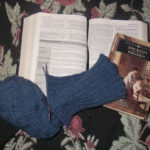 I have written before about how much I love to hear her make knitting requests from me (although they are typically tall orders!). Once I let go of the pressure to make sure I had it done by Christmas, I felt better. I know I will finish it this week, because I am not under the pressure! It seems to work so much better that way. Granted, it is all self-made pressure, but pressure nonetheless! As far as reading goes, I have started two books. 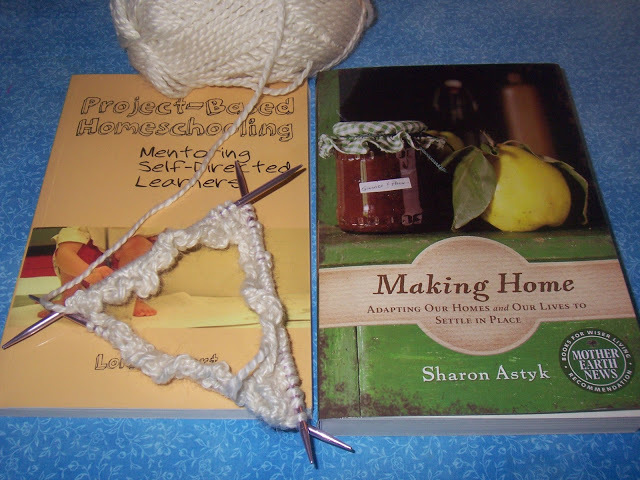 The first is Project-Based Homeschooling: Mentoring Self-Directed Learners, which I saw on the yarn along a while back. We are at the very beginning of our homeschooling journey, and I am constantly adjusting what we do to try and help my children be the best learners they can be. I think this book will have a lot of good information, and it will definitely be one that will take me a bit of time to get through. The other book that I am planning to start…soon…is Making Home: Adapting Our Homes and Our Lives to Settle in Place, which I received before Christmas but still haven’t started. I really would like to read this book with Matt. I talk and talk and talk about changing our lives, moving to a plot of land, enjoying a subsistence lifestyle, however, that is not happening today, or tomorrow, or even in 6 months if I am being honest. So, I have been working on making our house our home, and doing as much as possible to make it work for us, instead of using it as a temporary dwelling. I hope you all have had a wonderful holiday season! Do you take a break after the holidays from knitting? Or do you take one before the holidays like I did? Joining in with Ginny and her yarn along. 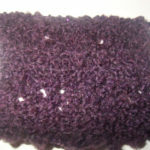 I love to knit hats, but wish they looked better on me… thinking about a preemie hat project someone has going. Oh I like the sound of the book – it is so true that we can do so much right where we are. I'll be interested to read a review on the Mother Earth news book–sounds really interesting! Hope you had a happy holiday gal—missed ya! I wish I knew how to knit! I've tried crochet and failed miserably. I don't think I'm patient enough for it! That 2nd book sounds really interesting. I love living in the country on our homestead and wouldn't have it any other way! Took us a little while to get out here but it was definitely worth it. She will love the hat and you are right – she will not care that it wasn't by Christmas 🙂 Those books both look great to me – both are right up my alley! Happy New Year! your books sound good. you know, we have homeschooled for a decade and still i am always tweaking what is going on, i think it is an ever growing process. the other book sounds like something i should read. we are years out from ever doing any sort of homesteading and i ways feel like i am in a holding mode. I'll be checking out Making Home – I'm seriously struggling with making "home" too these days. Just like you said I tend to feel very temporary here (even those we've been in this apartment 4 years now!) I think it's because we're so hoping to move and don't really want to settle in. But in the meantime I'm getting tired of feeling like I'm stuck in waiting. Oh I might need to get that one book about staying put. There is no way we could move even though I would desperately like to. I will have to look that one up. Both books look great! I added them to my book list. I still knit during the holidays just slow. I know she'll love her hat!